This guide will help you install Octoprint onto Windows. Do you just want to access your existing OctoPrint instance under Windows? Then there's absolutely no need to follow this guide, this is for installing the OctoPrint server under Windows, which is probably a rather unusual setup. If all you want is to access your existing OctoPrint instance (e.g. running on a Raspberry Pi via the OctoPi image), fire up your browser of choice and direct it to that instance's URL. Don't know what that is? Read this guide instead. While OctoPrint's intended use case is to be installed on low-powered embedded devices with Linux, it is platform agnostic and can also be installed under Windows instead of the more common option of installing it on something like a Pi. Make sure to disable automatic reboots for updates in your Windows configuration if you intend to run OctoPrint productively under Windows, or your prints will get interrupted by that when you least expect it. The nature of how windows handles file access also makes it currently impossible to update OctoPrint through itself (including switching to a release candidate and back to stable). You'll need to do that through the command line, and that might become annoying quickly. Install Python 2.7 for 32bit from here (choose the "Windows x86 MSI Installer" package). 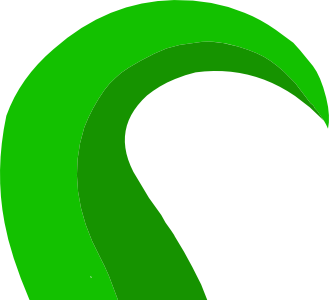 Make sure to include pip in the installation and also to have the installer add python to your path. Install the Microsoft Visual C++ Compiler for Python 2.7 from here. Do not close the window with the prompt, keep it open! Using the explorer, create a new folder for OctoPrint to reside in. For this tutorial we are assuming this to be C:\OctoPrint. Open a command prompt (cmd), change into OctoPrint's source folder (cd C:\OctoPrint) and create a new virtualenv: virtualenv venv. Activate it: venv\Scripts\activate.bat. At this point Windows will probably ask you if you want to allow OctoPrint to be accessible from within your network. Chances are high you want that, so allow access from trusted networks at least. Open a new tab or window in your browser and enter http://localhost:5000. 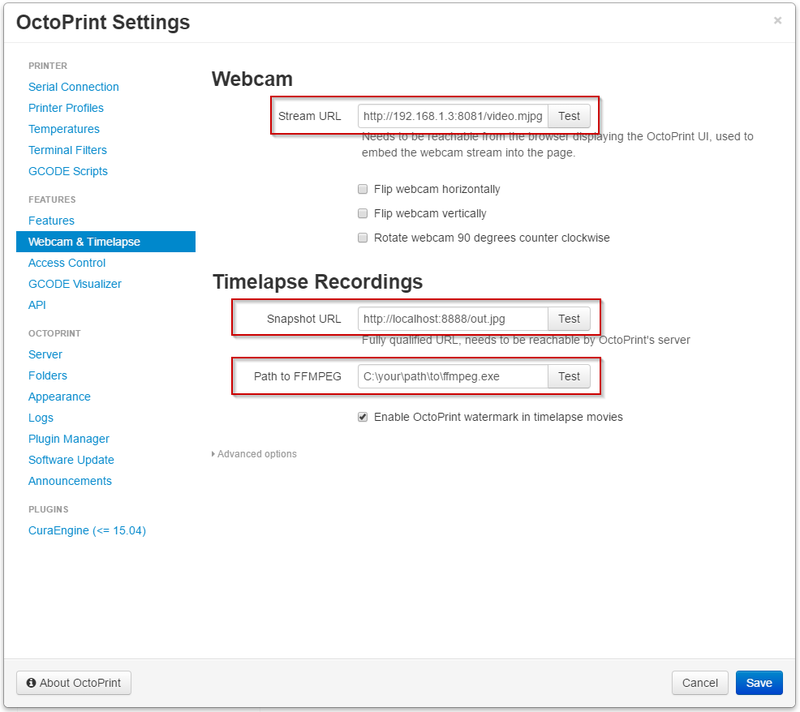 You should now be looking at your OctoPrint web interface. If you want to access it from another computer on your local network, substitute localhost for your PC's IP, e.g. http://192.168.1.3:5000. Congratulations, you now have a running OctoPrint setup! 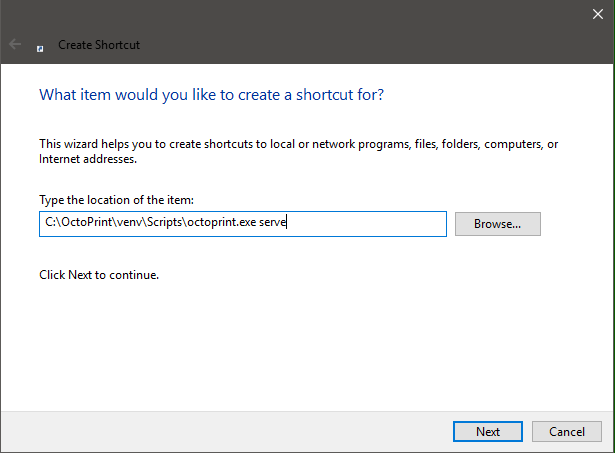 If you want to stop OctoPrint, hit Ctrl+C in the command prompt window or simply close it. You can use something like YawCAM for similar functionality to MJPEG-Streamer under Windows. Enable the "HTTP" and "Stream" outputs. If you leave the configured ports at their defaults, your Stream-URL will be http://<ip_of_your_pc>:8081/video.mjpg and your Snapshot-URL will be http://<ip_of_your_pc>:8888/out.jpg. The screenshot shows 192.168.1.3 as the IP of the PC in the configured Stream-URL. You'll need to adjust that to match your PCs IP! Shutdown your OctoPrint server. If it is running the update process will fail. 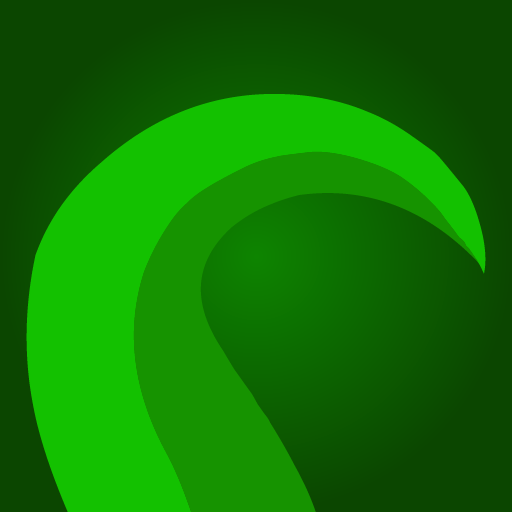 Restart your OctoPrint server. Your upgrade is done. In response to a question on another forum which referred to this post: The post above is not about using a Windows PC to access OctoPrint running on a Raspberry Pi (that's simply a matter of pointing your PC's web browser to the correct location). The above post details installing OctoPrint on a Windows PC, instead of running it on a Pi. @John_Mc It always astonishes me how people interpret things I've rephrased the first sentence a bit to hopefully make it crystal clear. I would like to run OctoPrint on a windows xp computer. I followed the tutorial as given and it seems to work up until I try to put up the server with the "octoprint serve" command. At this point, I get a RuntimeError stating that my version of windows is too old and I need psutil 3.4.2 to run on Windows XP. Is this a futile effort or do you know some way around this? I want to access my OctoPrint installation from the internet, how do I do that? Make sure to turn off your computer's power-saving features to include: sleep, network adapter, disks and desktop lock. This is my opinion of course, but not only is Windows XP of little use, neither is Windows these days. A Raspberry Pi 3 computer will set you back a whopping $35 plus the cost of a microSD card. Doing the math, if you leave your XP-based computer on 365 days per year, that will cost you about $225 for the electricity to run it. Compare this to the $5.71 that it would cost to run the Raspberry Pi 3 for a year. I agree generally. However there are plenty of Atom based Windows tablets floating around for arount $50 that have touchscreens and cameras built in so for me it's a better buy than a Pi and it can run everything a Pi can plus every other legacy app as well. You comment in your article that running octoprint server on windows is an unusual setup. I happen to have a windows 10 machine next to my printer. Is there any reason I don't want to run on windows? I'm perfectly capable of running linux on debian or buying another raspberry pie but if it runs on windows without any limitations I would rather not add another machine to the setup. Is there any reason I don't want to run on windows? Updates being more difficult is a thing and could get me to change over time but I'm probably good here. Don't know what these are. I appreciate the quick reply and can see how these are valid reasons for many people to not use windows. At this point I'll stick with windows unless another more compelling reason comes up. At this point I'll stick with windows unless another more compelling reason comes up. I teach software development. Every day a student walks up with some installation problem on a Windows-based laptop. Mongo doesn't install. Loopback won't compile. Mysql won't install. To me, the ~$35 cost of a Raspberry Pi 3B computer for OctoPrint is a no-brainer with respect to the minimal hassles you'll see. Interesting perspective. I have linux machines, raspberry machines, chrome machines, and windows at home for various purposes. Some of which are brought up in your list (although I'm not sure why backslashes vs forward slashes is a factor.). So this is not a factor of a fear of working with non windows machines. I work on linux machines every day at work and home. I just happen to have a windows machine next to the printer (for windows reasons) . Also for reference (not that it's a lot of money) but a pi is closer to $100 by the time you finish getting power adaptors, sd card, camera, case (well I guess now that I have a printer I can print my own case). The question isn't is linux better than windows but does this product fully work on windows. Why buy a low powered device when I have a full power server that has everything I need sitting 2 feet away? P.S. I agree. I don't like running mongo or Mysql on windows. Same with Postgres and Oracle. All of these products were designed for Linux first and windows as an afterthought and are complex software. I'm not sure why backslashes vs forward slashes is a factor. That one turns up in countless scripts in the npmjs space (think "npm install ...") in which someone blindly fetches the macro __dirname and then tries to concatenate /whatever to it. For Windows, that always breaks. There are correct ways of doing this with Node but because of that 99% factor, nobody puts the time into it. And then, there's an issue and someone then deals with it. I have a fondness for most operating systems. And yet every evening I have a line of Windows-based students who bring me new problems to solve. Every single week I chalk up one more thing to remember within this space as in "ah, Mocha just rev'd to 5.2 and now it's doing this (insert random bad thing)". In the world of open-source solutions your best chance of success is to have the same operating system, same major revisions of infrastructure and same browser choice as 80% of the coders who contribute to it. For each degree of deviation from that norm you collectively inherit 10% of all new issues with each revision of each module. Windows represents several degrees of deviation from that norm. There becomes a point where the aggregate number of hours chasing bug fixes over the span of a year greatly outweighs the cost of choosing the correct platform from the beginning. I will say that a Raspberry Pi 3B computer has something that your workstations and mine do not: 40 GPIO pins. Do not underestimate the awesomeness of being able to add sensors, relays and such to your computer. Can you plug a USB-based whatever into your Windows computer? Yes. But can you just design something new that nobody else has ever done and do the same? Not necessarily. The true power of a 3D printer is to unleash your inventiveness. Once you get into this mode, you'll start to see possibilities for modding this thing. Okay, I downloaded the tarball. What the hell is a tarball, and how do I squeeze my program out of it ? If I have to UNTAR it, why am I typing TAR ? What the hell does the -x do ?